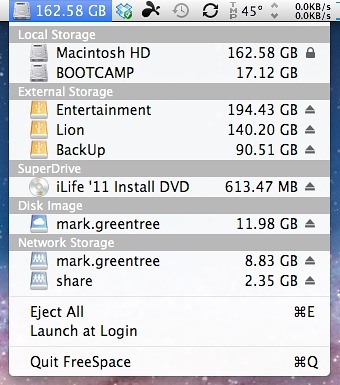 FreeSpace is a small utility application that resides in your menu bar to present a heads-up display of your current available storage on each specific drive connected to your Mac. Your storage drives are collated into areas such as Local, External, SuperDrive, Disk Image, and Network Storage. Time Machine backups will also appear in either the External or Network areas depending on your setup. Clicking on any of the devices in the list will launch the associated Finder window allowing you instant access to the files within. The default view and associated information in the Menu Bar is that of your local boot drive. If you have more than one internal hard drive in your Mac you can select that drive to be shown instead. It is disappointing that you can not choose any connected drive to be represented as the default. Users are also limited to seeing only the available free space on their drives. No options are available to see currently used, percentage remaining, or a visual breakdown of content as available in iTunes and the revised About This Mac area in Mac OS X Lion. Directly from this app you can unmount drives by simply clicking the Eject button. Your local storage or boot drive will not display these options as they are not removable when the system is running. A very useful feature is the ability to Eject All. This feature will save laptop users many minutes of frustration when needing to disconnect attached storage drives. In order to Eject All you will need to have the FreeSpace application expanded from the Menu Bar. Mounting and ejecting drives will also prompt a visual response from the app in the Menu Bar. The drive with a blue background indicates a successful connection whilst the drive plus the eject symbol illustrates a detachment of the drive from the Mac. Launch at Login is available but is not turned on by default. This was a disappointment as upon the first install and subsequent restart, the application was no longer present in the Menu Bar. It would be best, perhaps, for users to have such an option upon initial installation. When copying data from one drive to another the available storage in the specific drives changes in realtime. You may assume this functionality and the app in general would consume a reasonable amount of processing power and memory allocation. This is not the case. The app runs consuming very little resources which is great for users of Apple’s portable systems. For US$0.99 the app is priced well but lacks many basic features. Future updates to address a default Launch at Login, more options to view how the data is being consumed on connected drives, and the ability to present any connected drives as the heads-up display view in the Menu Bar would be welcome. Overall, the app performs as advertised and is a perfect solution for anyone wanting to know the available storage space on their connected drives. It removes the need to perform a manual Get Info prompt from the Finder. Therefore, I am awarding this app a MyMac.com review rating of 7 out of 10. UPDATE: Since publication, the developer has informed me that the inability to have Launch at Login option is a limitation imposed by Apple to developers. I had suggested in my review that it would be best if Launch at Login was turned on by default. The developer agreed and informed me that the app had been rejected previously by Apple because of this limitation. The guideline in question is below and is a direct copy from the Apple Developer Guidelines document. The final score issued for the review did factor in this limitation. I will take this opportunity to adjust the final score for the FreeSpace application to a MyMac.com review rating of 8 out of 10.